Chris - Dr Sani Aliyu is a consultant doctor at Addenbrooke's, one of Cambridge University's teaching hospitals. He's with us this evening. Hi, Sani. Welcome to The Naked Scientists. 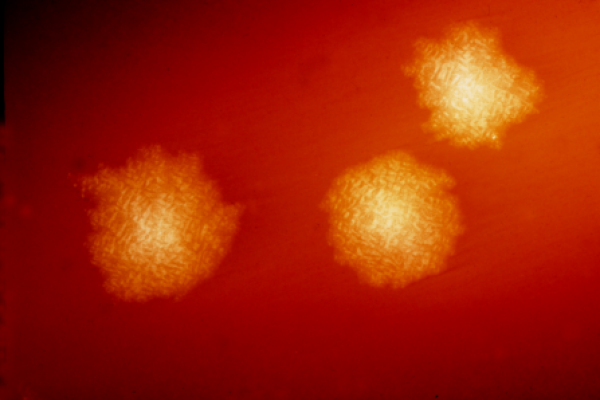 Chris - So C. difficile, what is it? Sani - Clostridium difficile is a gram-positive anaerobic organism. By anaerobic I mean it doesn't really like oxygen. It produces spores. When it vegetates, in other words when it proliferates, it produces toxins that cause quite severe damage to the large bowel. Sometimes you can have patients coming in for one reason or the other end up on antibiotics and end up having this infection. Chris - Where do we tend to get it then? Does everyone carry C. diff? Sani - Well, no. As an organism it's quite ubiquitous. In other words it survives in the environment. The spores themselves are quite hardy organisms. You can acquire them from the normal environment as well as from domestic and animals and farm animals. More frequently it tends to be in hospitals because you have patients that already have this infection and they're producing a lot of the organism and are contaminating the environment. Patients can easily pick up the infection from that. Is it just gut infections it causes or can it also get to other bits of the body? Sani - Well, predominantly gut infections what happens is the gut produces a lot of inflammation within the gut. As a result it can result in quite severe damage to the bowel, perforation, dehydration, severe diarrhoea and subsequently end-organ damage: including death. Chris - Because it's triggering diarrhoea I presume it's so easy for it to spread because it's making people go to the toilet a lot. Every time they go to the loo they're shedding more of these tiny spores into the environment and that makes it very hard to treat. Sani - Absolutely. Patients with diarrhoea can excrete as much as up to a million bacteria per gram of faeces. It can be quite profuse, really. Chris - Once you've got the spores coming out into say, a hospital ward or a toilet how do you get rid of them? Sani - Predominantly by good cleaning, really. The spores themselves are quite hardy organisms. We know that they respond - they are quite sensitive to chlorine-based products. Using alcohol, for instance - alcohol gel - in hospitals wouldn't get rid of the spores. Chris - Why is it mainly old people who tend to suffer with this? Why is it people our age - I know that as a percentage of the population there's fewer of us lot in hospitals - but when you look at people in hospitals the proportion of old people getting C. diff is usually higher. Is that just because they're more vulnerable anyway? Sani - Yes. As you get older your normal immune system really doesn't work that well. As a result it means when you acquire the organism, when you ingest the organism, as a young person your immune system will probably be able to keep the immune system at bay. At the same time we know about the concept of colonisation resistance. In other words you have bacteria in the large bowel that tend to protect you against acquiring the organism. As you get older this resistance isn't really as good as it should be. Chris - In other words your body's own bacteria effectively take up the available space. There's nowhere for the C. diff to fit in. If you kill those bacteria with a dose of antibiotics or just because that bacterial flora changes with age anyway it makes openings or niches that C. diff can then get into more easily? Sani - Yes. In fact the normal bowel flora as we call it prevents the overgrowth with C. difficile by depriving the organism of micronutrients which means it can't establish an infection. Chris - In terms of why it's such a problem now, because ten years ago it was a few cases, now we've got 7000 deaths a year. Why'sthe graph going up exponentially like that? What's happening? Sani - It's partly due to improved reporting. Over the last few years we've put in place mandatory reporting processes which means that if you have a case of C. difficile you have to report it. The testing has also changed. In the past we used to test in individuals that are over the age of 65 but nowadays anybody having diarrhoea above the age of two. You have a more virulent that first emerged in Canada about 5 years ago and has since occupied the niche that used to be occupied by the more sensitive strains. Chris - When you say more virulent what do you mean by that? Sani - More virulent in terms of producing more toxin, causing more diarrhoea, causing more illness and probably more deaths as well. Chris - Do we know why this has come about? Is it just because it was a random mutation? It just appeared and because it was so much more prolific in terms of its production of diarrhoea and its ability to spread that it just went all over the world? Sani - I think it's fairly different from other strains of Clostridium difficile in that it has a deletion in the gene. There's a gene that negatively regulates toxin production. This particular ribotype called the autosomal ribotype has a deletion in that gene which means it can produce much more toxin and it can germinate for a longer period of time than other ribotypes of Clostridium difficile. Therefore you tend to have more spread as well, more environmental contamination as a result of a more severe disease. Chris - What can we do about it? Sani - In the first place we can restrict antibiotic use. A lot of times we use a lot of antibiotics in the community as well as in hospitals that we probably don't really need. That's one. Secondly, by improving cleaning and making sure that you interrupt the transmission process from patient to patient either by washing our hands, isolating patients promptly, putting them inside rooms, avoiding contamination of hospital equipment - that will go a very long way to reduce the infection. Chris - Lastly, how long do you think it's going to take before we get a handle on this problem and can bring it under control? Sani - I think we will. It might take another -being on the optimistic side - another five years. There are new things coming up like vaccines which we hope will probably reduce the incidence of infection. We're having new agents as well coming in which at the moment look quite promising.